“People are hungry,” says Leopold. “They’re trying to understand the economic chaos around them. It’s hard for them to put the pieces together. By building a common understanding of the problems we face—that, as one chapter of the book puts it, “everything is connected to everything else” and an injury to one is an injury to all—the program aims to build a cross-movement alliance that can take on the economic and political elite. This program developed out of a six-month training that a group of 20 Verizon workers went through in 2015. Whenever CWA trains members on any topic or skill, the union makes a point of including some political education too, with the goal of “building a broader political analysis,” says Margarita Hernandez of District 1, one of the coordinators of the program. So once a month, before afternoon sessions on organizing and political outreach, the group spent the morning with Leopold, who presented material from his book. So the union worked with Leopold to put together a three-day “train the trainer” workshop in January 2016, where participants learned to facilitate Runaway Inequality workshops in small-group settings. Activists from the immigrant worker center Make the Road New York and the community organization Citizen Action attended too. “We went over it, we practiced it, and we did it—and they sent us out into the world,” says Dennis Dunn, a Verizon FiOS tech and chief steward with Local 1108 on Long Island. Now dozens of rank-and-file trainers regularly lead the workshops for other union members and community activists. Each full-day Runaway Inequality training holds 20 to 30 people. At tables of five or six, participants work together to answer various questions. In one activity, groups are asked how much they believe the average CEO of a large company makes, versus the average worker. “Most people get that there’s a pretty big gap,” says Ragucci. “But then when they see the number, they’re usually pretty off.” The real ratio is 844:1. In another, they’re asked to list off as many U.S. social movements as they can—and the trainers highlight that some of the most important periods of union organizing coincided with outbursts of social movements, in the 1930s and 1960s. That familiarity can help facilitate hard conversations around race and immigration, both covered in the program. Participants look at examples of how bosses have used race to divide workers, and learn about the wealth gap between races—including how even Black college graduates have much less wealth on average than white high school dropouts. Ragucci led the training with members of his own local who work at the toll collection agency EZ-Pass, during their recent contract negotiations. Dunn has led it for locals on Long Island and in Boston, and did a shortened version at the union’s national wireless sector conference last summer. CWA held a second train-the-trainer last year for members in states in the middle of the country. A third is planned for April. Besides teaching their fellow CWA members, trainers have been volunteering to lead sessions on their days off for members of other unions and community groups. For instance, Ragucci has done a few trainings for members of Sustainable Staten Island, a coalition that emerged from the Verizon strike and includes worker centers, the New York State Nurses, the faculty and staff union at the City University of New York, and environmental organizations. Joseph Mayhew of CWA Local 1103 has pulled together trainings that mingle members of unions, community organizations, and faith groups through the Westchester-Putnam Central Labor Council, north of New York City. After the Verizon strike, Dunn was invited to fly across the country to speak at a conference of AFSCME Local 3299, the union of service workers at the University of California campuses and hospitals. He brought copies of the Runaway Inequality book and pitched the trainings there. Leopold is already working to spread the program. 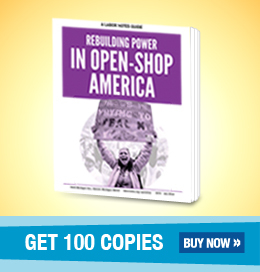 He’s sold thousands of copies of his book to other unions, including the Steelworkers, National Nurses United, and the New Jersey Education Association, and has trained members of other groups to offer the workshops too. On a recent trip to the Bay Area, he led a training with the Sierra Club, the Steelworkers, and CWA, which even took up the thorny question of alliance-building between environmentalists and labor. Now he wants to open it up to the public at large. He’s planning a series of two- to three-day train-the-trainer sessions across the country, wherever he can find 20 or 30 interested people. The aim: to build an army of educators. “The model behind this is the Populists of the 1880s, who fielded 6,000 educators,” he says. A version of this article appeared in Labor Notes #457. Don't miss an issue, subscribe today.